Divorce is probably the most emotional thing a family will ever go through. Children, even ones that are well-adjusted, often need someone to talk to besides their parents about the situation. One of the best things you can do for your kids in divorce is to find a qualified counselor to help them through the process. In fact, counselors and psychologists often play important roles during divorce for both families with children and individuals who might need counseling themselves. Depending on the situation, you can ask a court to mandate counseling for your children if you think it is going to help your family. But it’s probably something you and your attorney should push for with your spouse and their attorney to ensure your children are taken care of. You want to focus on the big picture, and the big picture should be figuring out what is best for your children. Once you decide you want to find a counselor or psychologist for your children, your next step is to talk with your attorney about who they’ve worked with in the past that they trust that they think will do a good job. You also want to make sure you find someone who is well-trained in dealing with children. There are a lot of therapists out there. Some are more suited to adults, some are more suited to children. Again, you can look to your attorney to help you find someone that can best help you and your family. Of course, counseling isn’t needed in every case. If your children seem to be holding up well, you might just ask the school counselor to check in on them every once in a while and make sure they don’t notice any issues you might be missing. If you do decide to seek counseling for your children, you shouldn’t worry about what might come out about you or your wife. By seeking help for them, the judge will likely respect the fact that you are putting your children’s needs before your own. Even when children are not in the picture, a counselor or therapist can still be beneficial. When you’re in the middle of litigation and fighting for a fair settlement, it can be difficult to turn your focus outward and think about how you’re going to move on once your divorce is final. 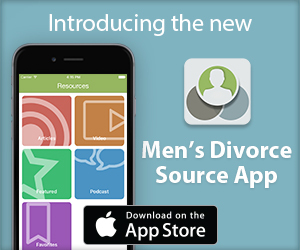 Men face increased physical and mental health risks after divorce, and counseling can help you with the transition to the next stage of your life and recover from the trauma of divorce. Often, counselors can also help with the actual litigation process. For example, say you were in an abusive relationship and have been taking some counseling to deal with that. If you want that abuse to be taken into account in the final division of property, you need to bring in your counselor to testify about the things you’ve gone through. There are many instances when counselors or psychologists are called to court to testify. If you want to bring a family therapist to court, you first need to have your attorney make sure they’re comfortable doing so. Many clients are concerned about information they disclose to psychologists being discoverable, but the substance of what is talked about with a counselor is protected under the rules of evidence as well as HIPAA laws. There is a very high burden of proof for that information to be discoverable. Prior to divorce, it is common for couples to have been in marriage counseling in an attempt to save their marriage. Often, there will be a breakdown in communication and one of the parties will decide to separate and file for divorce. In those instances, it is still very difficult to enter whatever was said in those counseling sessions into evidence. However, it is possible for one of the parties to sign an HIPAA release to gain access to those records. Therefore, there is a risk that once you’re in counseling, even though you’re encouraged to be honest and forthright, the information could be used against you if either you or your spouse elects to get a copy of the records. “If that would happen, a good recommendation would be to talk to your lawyer right away so your lawyer isn’t caught off-guards and then you can be preemptive and proactive in how to handle certain situations that may arise,” Zurek said. This can be a sticky situation because when you enter counseling, you’re trying to work to save your marriage, but if the marriage fails, you don’t want to have revealed anything that can be used against you. “If you feel like you’re doing a majority of the work in counseling, if you’re the one that’s trying to change, and you’re the one who’s trying to do everything to make it work and there hasn’t really been that same type of change on the wife’s side … it’s probably not going to work and you might want to think about filing (for divorce),” Zurek said. Counseling can be very pricey. Some counselors charge hundreds of dollars per hour. But there are resources available to find quality options and ways to help pay even if you are not financially set. “Your lawyer should be keyed in enough to the legal community and keyed in enough to the psychological community to know who can help you in your situation,” Zurek said. Many health insurance plans have some coverage four counseling and will pay for an allotment of sessions. Check with your employer’s human resources department to find out what options you have available. This has an Incredibly inaccurate and misleading statement. A counselor rarely testifies and this actually is giving up privileged information, in which case the Judge can suppena therapy notes that may not be in the clients best interests wanting support.